In the Steve Jobs biography a specific mention about a smart TV is made. Steve said “It would be seamlessly synced with all of your devices and with iCloud. It will have the simplest user interface you could imagine. I finally cracked it”. Although we wont know for sure that Apple [AAPL] is making a smart TV, this reference from the book along with other bits of information found over the past few months is strongly hinting that Apple could be preparing to introduce the device. 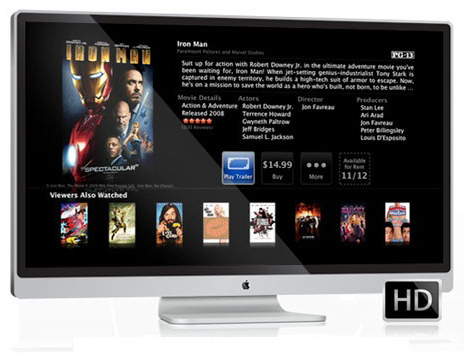 Some reports hint that the Apple Smart TV could be double or triple the price of a regular TV. Some are also hinting at Siri support built in to perhaps search your collection of music/video as well as initiate FaceTime calls with your voice. If Apple does tie the device in with the iOS/Lion experience we also expect the same ease of use and easy access to your content wherever you are. It all sounds quite interesting really, especially when you think about being able to access anything on any device along with being connected up to millions of other users via Game Centre. As mentioned above, we have no idea if this will actually make it to production but we are hearing that it is getting close. Just how close, we don’t know.